West Linn Community Preschool (WLCP) is a co-op (or cooperative). A cooperative school is run by a parent community that helps in the classroom, is involved in decision-making and provides other support to ensure the school’s operations. We are a non-profit organization comprised of families who take an active interest in their children’s first educational experience. In a co-op preschool, the teacher is the only paid employee. At WLCP, our professional teacher, Cathy Vause, provides intentional, relationship-based teaching and a learning environment which focuses on creativity, community and curiosity. Our teacher, Cathy Vause, has been teaching at WLCP since 1980. She received her degree from Oregon State University. Teacher Cathy brings a wealth of knowledge that is uniquely acquired through her years of classroom experience. Her training at OSU’s Child Development Labs - which she implements daily - further enriches her teacher knowledge base. 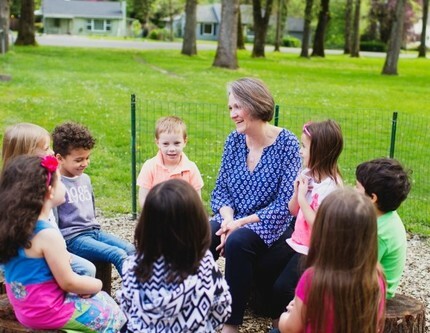 Teacher Cathy's cheerful nature, her seemingly infinite patience and genuine concern for each child sets a positive tone for their early learning experience. She has taught returning generations at WLCP - this is a testament to her and the school.